New Ray Toys has been around for a long time and offers a great selection of dirt bike toys. Their attention to detail is remarkable, right down to the last sponsorship decal. Our New Ray dirt bike toy collection started with a stocking stuffer a few years ago and the collection grows larger every year. Finding inexpensive dirt bike gifts that kids can give as presents can be difficult, especially since kids want to buy something that's more fun and personal than chain lube or premix oil. The New Ray diecast dirt bike toys are a perfect gift for kids to give. The 1:12 models are something they can afford ($10-$15), and they come in a nice square box so they're easy to wrap. Plus, they enjoy seeing them displayed on the top of my computer desk. What does 1:12 Scale mean? 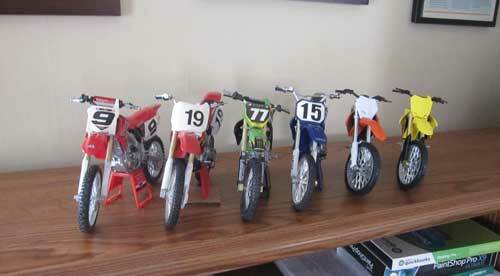 There are several scale sizes related to dirt bike and diecast toys, but the 1:12 scale seems to offer the best selection for dirt bike toys. The 1:12 scale is sometimes called the Traditional, Classic, and/or One Inch scale and is often used for models and miniatures. With the 1:12 scale, one foot of the real-life object is equal to one inch of the model or toy. For example, the seat height of a real-life Suzuki RMZ450 motocross bike is roughly 37 inches tall, which is just over three feet. 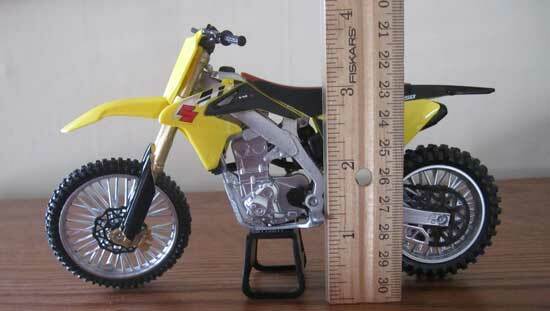 With the 1:12 scale, one foot equals one inch, so the toy dirt bike seat is just over three inches tall. 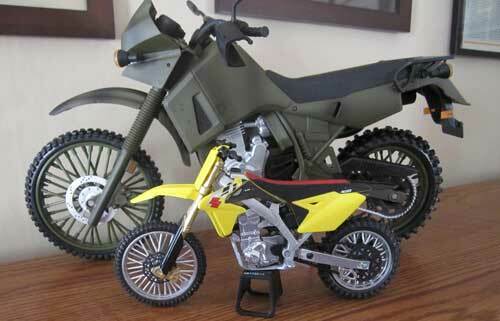 The image below shows an example of the 1:12 scale using the Suzuki RMZ450 dirt bike toy. 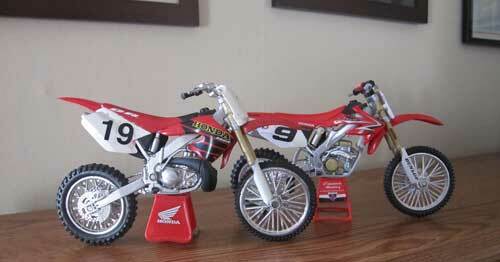 Dirt bike toys come in 1:6 scale as well as 1:12 scale. The 1:6 scale is also used for toys such as Barbie and (now discontinued) G.I. Joe, and is sometimes referred to as Fashion scale or Play scale. With the 1:6 scale, one foot of the real-life object is equal to two inches of the model or toy. Using seat height again, the seat height of a Kawasaki KLX 650 is roughly 35 inches and since the 1:6 scale is two inches per foot, the seat height of the Kawasaki toy is just a hair under six inches. The image below shows the difference in size between a 1:6 scale Kawasaki KLX650 and a 1:12 scale Suzuki RMZ450. The 1:12 dirt bike toys are okay for kids over eight years old, but there are some sharp edges (i.e. the handlebars) that can be dangerous for small kids, and there's a choking hazard for kids under three years old. The toys won't hold up to being thrown across the room during the occasional temper tantrum of smaller kids either. The older New Ray models are attached to the lift stand via two small screws. In order for kids to be able to play with the toys, the dirt bike needs to be removed from the lift stand so the wheels can spin. Removing the small screws isn't difficult, but if you want to display them on your computer desk after Junior is done winning the AMA Supercross championship, replacing those two small screws into the two small holes using a very small screwdriver can be really aggravating. If you drop one of the screws into carpeting, there's at least fifteen minutes of your day gone. The newer models have a keyhole-type attachment so the bike is much easier to remove and replace on the lift stand. If you're looking to start a New Ray dirt bike toy collection, decide which scale size will fit on the intended display shelf and investigate the selection offered in that scale size for subsequent purchases. The 1:12 scale toys are less expensive than the 1:6 scale and also offer a larger selection. The newer models no longer come with numbers, and the numbers don't seem to be available to purchase separately. The KTM 350SX-F and Suzuki RMZ450 pictured in the image at the top of the page are the newest additions and they did not come with numbers for the plates. There are very few two strokes dirt bikes- almost all are four strokes. The current two stroke choices appear to be a Honda CR250, and a Husqvarna FE510, but they're not as widely available so the price is usually considerably higher ($40 for the FE510 on Ebay at last check). The image below shows a Honda CR250 (#19) and a Honda CRF250R (#9). The New Ray Toys website is a good source for which dirt bike toys are available, but you can't purchase the toys directly from their website. Brick and mortar stores such as Walmart and Target no longer seem to stock the New Ray brand, opting instead to carry only mega name-brands such as Disney and Mattel. Your best bet is to check some of the online dirt bike stores as well as Ebay and/or Amazon. If you're buying from Ebay or Amazon keep in mind that the seller isn't necessarily a dirt bike enthusiast and may not be aware that a Honda CR is world's apart from a Honda CRF, so look at the pics before buying. We bought a Yamaha YZF450 but received a WR426 instead, which was fine because the WR is much harder to find than the YZF so we kept it. The Yamaha and the Honda CR250 two stroke (the original stocking stuffer), were purchased on Ebay several years ago. The rest of the collection came from Amazon simply because they had all the Big Five dirt bike toys in stock at a reasonable price and the shipping was free (if you have Prime). They had the Honda CRF250, the KTM 350SX-F, the Kawasaki KX450F, the Suzuki RMZ450, and the Yamaha YZ450F. They also have some race replicas such as Ken Roczen's Honda, along with Roczen's Suzuki RM-Z450. We keep looking for the Husqvarna, but so far, no luck. Most adult dirt bike riders are long past making vroom-vroom noises with toy dirt bikes, but that doesn't mean the toys don't hold a special place in our hearts. They may be plastic kid's toys to some people, but to dirt bike riders they're a tangible piece of history.